Cinnamon works well in repelling ants. You can use a whole cinnamon or clove and place it where the ants frequent. Or you can use some cinnamon essential oil with high eugenol content to apply on those areas. Lemon juice messes up the senses. You can spray some on the affected areas. You can just take a slice of lemon and rub it on the areas. Or you can spray a mix of lemon essential oil with water. For avoiding any future infestation, just sprinkle some lemon peels near the windows and doors. Vinegar is the secret miracle for most natural tricks. And it helps to get rid of ants as well. You need form a mixture with equal quantities of vinegar and water. You can add some essential oil to it to mask the scent as well. Spray this liquid around the nooks and crannies. You can wipe away the ants after an hour or so. To completely get rid of ants, this needs to be done regularly till the ants are no more. You can use peppermint for this as well. The first method is to sprinkle dried peppermints on the areas. Or you can go the easier way and get some peppermint essential oil. Mix this with water and with a spray bottle, spray it on the affected areas. Another solution is food-grade DE. Diatomaceous Earth is made of the fossils of marine phytoplanktons. It is a renowned repellent for ants. The edges of DE are very sharp. They are capable of slicing through the exoskeleton of the ants and this renders them weak. You just have to apply some on the affected areas. This needs to be repeated till all the ants are killed. 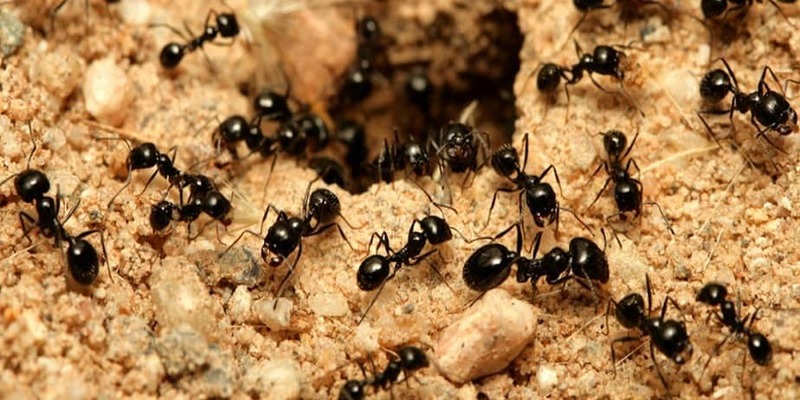 Borax is another method of eliminating ants. It draws the ants to itself and when they consume it, it kills them. To make it more appetizing to the ants, you need to mix some jelly with borax. This should be laced where the ants are usually spotted. You can also use it with icing sugar in a ratio or 1:3. You can make a paste of it and apply it on the areas that the ants roam. Yet another paste that you can apply is of borax and cornmeal. If you are tired of ants crawling over your sugar container or your honey, you can apply some dishwasher liquid mixed with water on it. This will kill the ants. If nothing else, the easiest method to repel ants is through chalk lines. Draw a line in chalk and the ants will be contained within that area. Ants have acid in their bodies. So if you expose them to a mix of baking soda and water, it kills the ants from inside. Ants are killed with tea leaves as well. All you need to do is mix it with apple juice. It is supposed to be a neurotoxin. Ants bite and while their bite doesn’t kill or cause harm, it not pleasant either. It is difficult to pick and choose places to sit or keep things because there might be ants. The best way to avoid it is by getting rid of them altogether.